According to Basel III, financial institutions have to charge a credit valuation adjustment (CVA) to account for a possible counterparty default. Calculating this measure and its sensitivities is one of the biggest challenges in risk management. Here, we introduce an efficient method for the estimation of CVA and its sensitivities for a portfolio of financial derivatives. We use the finite difference Monte Carlo (FDMC) method to measure exposure profiles and consider the computationally challenging case of foreign exchange barrier options in the context of the Black–Scholes as well as the Heston stochastic volatility model, with and without stochastic domestic interest rate, for a wide range of parameters. 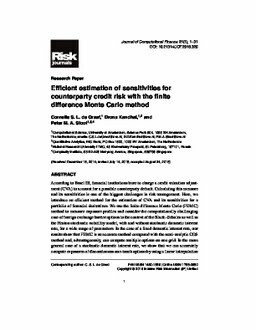 In the case of a fixed domestic interest rate, our results show that FDMC is an accurate method compared with the semi-analytic COS method and, advantageously, can compute multiple options on one grid. In the more general case of a stochastic domestic interest rate, we show that we can accurately compute exposures of discontinuous one-touch options by using a linear interpolation technique as well as sensitivities with respect to initial interest rate and variance. This paves the way for real portfolio level risk analysis.